May God Bless you and your team on the tremendous support you provide us. I can honestly say not all soldiers receive loving letters and items from home and when I open a box from one of your supportive members who has adopted me to provide a care package too, it and that is a blessing to them and an honor for me to open for them. Requested items are genuinely received which I place in our common area for all and that area is and becomes a shopping mall for all our units which also includes the US Navy. SSG Sandra Rolon, US Army & Any Soldier® Contact. 10 Mar 2009: "Your organization is actually just what the doctor ordered--legitimate and up-to-date names/addresses are what we're looking for, as we already have the boxes/contents. Thank you so much for your help!" 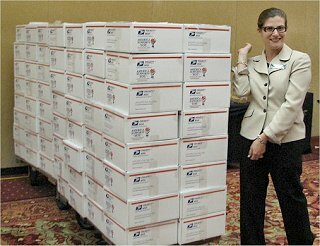 26 Feb 2009: "Everyday, I see the packages pour in for our Marines and Sailors and I have to admit, it is staggering. I have deployed several times and I have seen several "Any Serviceman" type programs - mostly letters, sometimes books - but I have never seen anything like the love, appreciation and support that comes from the people who visit this site. It is, in a word, AWESOME. Thank you all for your support." 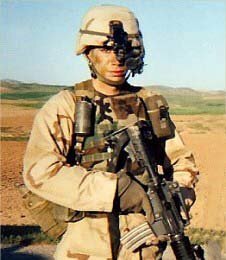 Major Shawn Hughes, USMC & Any Soldier® Contact. "Your organization's troop postings help our citizens show their steadfast support for our Armed Forces, and I am grateful." "By establishing an extensive network of U.S. soldiers available to distribute letters and care packages from home, Any Soldier Inc. has taken a leadership role in making sure the men and women of our military receive vital emotional support in their times of greatest need." 29 December: "Canton Students Send Soldiers Reminders Of Home"
29 December: "Local women adopt soldiers in the warzone"
29 December: "NEIGHBORS: Ex-POW heads effort to supply troops with care packages"
25 December: "York woman uses Web site to ‘adopt' U.S. soldiers"
23 December: "Send a package to someone serving overseas"
23 December: "Cydcor Community Service Helps American Soldiers by Donating to Any Soldier Inc."
19 December: "Students ambush Guard member"
18 December: "Merry Christmas from the Army"
17 December: "Youth Advantage members send holiday cards to soldiers"
12 December: "Preparing holiday packages for the long haul"
10 December: "Woman seeks help with troop donations"
8 December: "Care package from home has Oregon troops 'so stoked'"
3 December: "Bring donations to Komets games"
1 December: "Local businesses gather boxes for soldiers"
30 November: "For the troops"
26 November: "Packages to U.S. military help ease their load"
25 November: "GIFT GUIDE SLIDESHOW"
24 November: "Sending packages overseas"
19 November: "Care packages bring love from home"
15 November: "Salem Church First Graders are Assembling Gifts for Soldiers"
15 November: "Remember the troops this holiday season"
14 November: "Montecito residents send holiday cheer to troops"
12 November: "Montclair Community Gets Together to Commemorate Veterans and Lost Heroes"
* 11 November: "Raising Morale Far From Home"
11 November: "For A Good Cause"
10 November: "Eagle Scout project to benefit troops gets overwhelming response"
10 November: "As house sells, many fond memories come to mind"
10 November: "11-11-09 McKinley Student Is On A Mission For Our Troops"
9 November: "Students, community groups send love, treats and prayers to troops"
7 November: "Big Bend briefs"
7 November: "Rave for the box packers"
6 November: "Remember the future veterans serving our country now"
* 3 November: "Too early to think of troops? Think again!" 2 November: "The Greater Frederick Advertising Federation Explores 'The Claustrophobia of Abundance' While Supporting U.S. Troops Overseas"
28 October: "Nick Hotel Says Thanks with Military Appreciation Month"
27 October: "Citizen of the Week -- Diane Schueler"
27 October: "Following fun, don't forget to fall back"
* 26 October: "Any Soldier"
17 October: "Southborough woman organizes care packages drive for troops this weekend"
16 October: "Eagle project sends care to troops"
16 October: "'Tis the busy season for sending gifts to soldiers"
15 October: "Ft. Lewis soldiers have medical/personal supplies stolen in Af-Pak"
15 October: "SouthernLINC Wireless Gives a Little 'Home' this Holiday Season to Soldiers Stationed Overseas"
8 October: "Shoes sought for Afghani children"
7 October: "7 (Maybe 8 or 9) Ways To Green Your Halloween"
25 September: "Buy a hot dog, send treat to the troops"
17 September: "Securities America Marks 25th Anniversary With 25 Weeks of Community Service"
9 September: "If Nanny was right, winter will be white"
7 September: "Support our troops"
31 August: "Sophia Snow Place residents send packages to troops"
19 August: "Care packages provide comfort to soldiers abroad"
-18 August: "East Stroudsburg post office delivers for soldiers"
8 August: "American Legion, Elks join forces to 'box up' for troops"
4 August: "USPS "Support Our Troops" Campaign Continues to Gain Momentum"
3 August: "Greater Frederick Advertising Federation Partners with AnySoldier.com to Send Care Packages to Troops"
27 July: "Fighting the War.. One Box at a Time"
24 July: "Support Troops For The Price Of A Stamp"
18 July: "Jennifer Marino, Keith Walters"
15 July: "Residents bring sunshine to troops"
14 July: "Fort Rich soldier remembered at memorial service"
10 July: "1SG Luke Alphonso returns from Korea"
8 July: "1SG Steven Holden, Honorable Mention, Army Times Soldier of the Year"
6 July: "5 more ways to love your neighbors"
3 July: "A fiery 4th for grown-ups, too"
3 July: "Three cheers for the red, white and blue"
24 June: "'Nice-a-holics' look for ways to help others"
9 June: "Pickerington connection leads to correspondence with Marines"
27 May: "S. Hadley housewife cheers up GIs"
24 May: "Guest column: Support your war fighters"
23 May: "Spitz: Many ways to honor the fallen"
20 May: "Your Mission: Make Memorial Day Memorable!" 20 May: "Operation Pencil Push"
14 May: "Armed Forces Day: celebrate with your kids"
14 May: Live Internet Radio Interview with Lorin & Dixie Ricker and Don on the "Walking a Walk" show. 12 May: "Honoring Southborough woman's efforts to help the troops"
5 May: "West Side Elementary Supports Marines In Iraq"
4 May: "Head Start sends care to troops"
1 May: "Showing Appreciation for our Military Personnel — Past and Present"
-30 April: "Monroe military mom is on an 'anysolder.com' mission"
30 April: "Family receives warrant officer's combat awards"
16 April: "A man worthy of your words"
15 April: "What's Right With Kids Today? Nick Sisti: Encouraging the Troops!" 14 April: "Teens pack boxes of goodies for soldiers serving in Mideast"
14 April: "Web connects couple to troops"
11 April: "Don't forget those who serve overseas"
9 April: "Care packages, with a feminine touch"
5 April: "TOPIC: Bill Van Winkle, passed away this past week"
1 April: "10 Things to Recycle That You Never Thought You Could"
1 April: "Woman Shows Support With Care Packages"
25 March: "Sending sisterly love overseas"
23 March: "West Side Elementary, Northwest Georgia Bank partner to support Marines in Iraq"
19 March: "Moultrie teacher makes pupils part of current events"
13 March: "Hands in motion touch lives of soldiers"
12 March: "Soccer smiles continue in Afghanistan"
5 March: "The Sister Soldier Project Launches New Website"
5 March: "Soldier pen-pal visits R-MA"
25 February: "Making a difference: Teachers, students and parents can support troops"
22 February: "Helping soldiers cope with hardships"
13 February: "Christmas on Forward Operating Base Apache"
12 February: "Operation Soccer Balls"
9 February: "Making a difference, one soldier at a time"
8 February: "Operation Soccer Smiles"
1 February: "Harley care package collection"
31 January: "Harley care package collection"
31 January: "Care packages for troops overseas"
29 January: "Wekiva Students Flying High After Flag Raising"
28 January: "Troops in Iraq, Afghanistan grateful for Lehigh resident’s boxes"
17 January: "Rocker Stapp, NBC2 anchors golf for troops"
17 January: "My pledge for 2009: pursue justice, show mercy, and love my neighbor"
8 January: "Local Harley shop collecting packages for overseas troops"
8 January: "Troops need show of gratitude now"
6 January: "Randolph-Macon's Portillo receives awards for her dedication to volunteer work"
5 January: "Christmas in Afghanistan"
2 January: "Students send soldiers packages"
2 January: "Combined efforts aimed at honoring our soldiers"
I represent the employees of the Brookhaven Campus of the Internal Revenue Service. Brookhaven Campus has 3000 employees and is located on Long Island, New York with a satellite call center of 500 employees in Buffalo, NY. In honor of Veterans Day, the Brookhaven Campus, and the local chapter of Military Outreach for Service-IRS launched the first-ever campus-wide Adopt-a-Soldier campaign. Employees and teams adopted more than 600 soldiers. The campaign organizers, Selene Markowitz, Patrick Kearney, Linda Miller ,Barbara Ciniglio, Jennifer Noeller, Peggy Minnick, and Kristie Jones solicited names of friends and relatives that were serving abroad. Teams picked a name and filled a mailing box with personal care products, food and miscellaneous items, such as DVDs, pens and insect repellent. In addition, coordinators accessed the AnySoldier.com website to 'adopt' New York based soldiers as well as a unit affected by the recent tragedy at Fort Hood, Texas. The campaign also collected items for military dogs and their handlers. Employees donated chew toys, treats and blankets to these special and sometimes forgotten members of the armed forces. Representatives from the post office brought two large trucks to pick up the care packages, and several local members of the military visited to thank the volunteers and help load the postal trucks. Organizers enclosed a letter and an addressed postcard in each box so the soldier would know where the box came from. Organizers hope that once the team receives the postcard back, they will continue to send care packages throughout the year. We are all very proud of the work our soldiers are doing and hope that our boxes of goodies will help make their tour a little easier. Our employees were very enthusiastic about this opportunity to 'adopt' a soldier. We have started to receive letters and pictures from the soldiers. 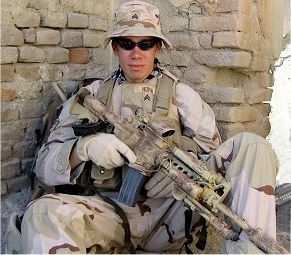 I have attached some photos of our staff as well as photos that were sent from the soldiers. Without access to AnySoldier, we would not have been able to reach as many soldiers as we did. 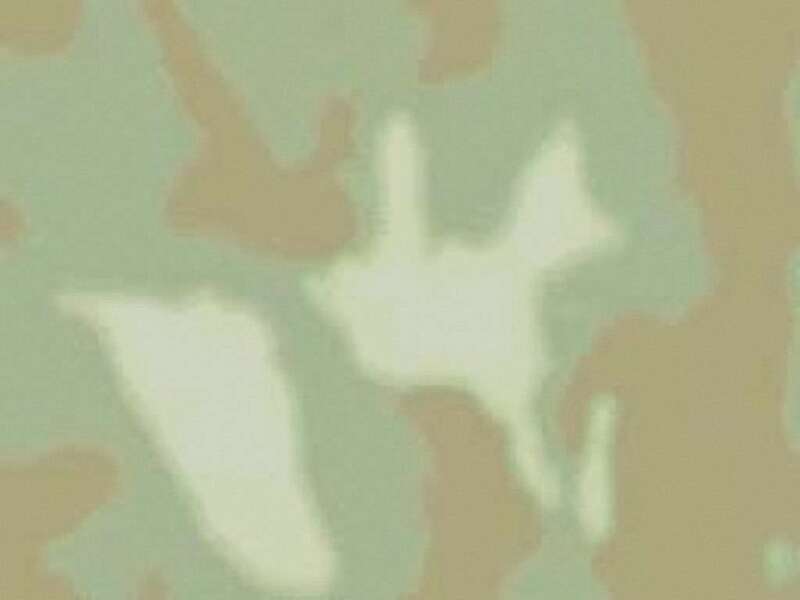 Thank you AnySoldier.com for the important service that you provide. 16 November 09: Charlie's Eagle Project had a incredible outcome. The Scouts packed 318 packages on the packing day, and we have had another 15 boxes packed since then, for a total of 333 care packages. 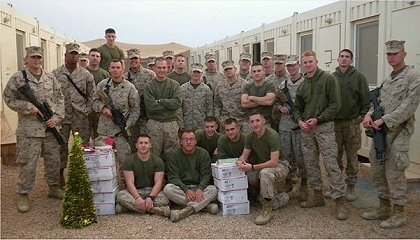 Charlie had already had $3605 donated for shipping and project cost, but with the amount of care packages taking everyone by surprise, Charlie ended up having to send out a email asking for additional shipping funds. His story was picked up by the Ft. Worth Star Telegram for Veterans Day. Since the story, Charlie has received an additional $1361, with another $700 promised. With the tremendous number of items donated, and the funds donated, the project ended up being worth about $10,000. We are all so very proud of Charlie's hard work and we are so pleased that so many of our soldiers will be receiving a care package for Thanksgiving. Just 7 days after shipping, Charlie has already had an email from a soldier. 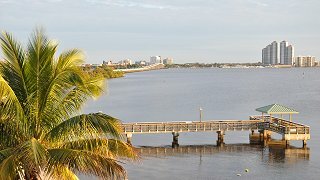 I have attached a couple of photos from the project and a link to the article. 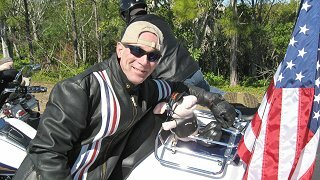 We hope that Charlie's project will increase awareness of AnySoldier.com so that our troops will benefit from all the support. 8 November 09:The Cumberland County Community Chorus gave a Veteran's Day Benefit Concert, the 'American Heroes' Concert held in the auditorium of Stone Memorial High School located on Cook Road in Crossville, TN. The afternoon program was a collection of patriotic melodies and American favorites. Others sharing the stage for this benefit concert were a Brass Quintet from the Southern Stars Brass Orchestra; Ann Looney, piano accompanist for the chorus and a soloist; Marty Gibson, chorus director, musician and vocalist. A freewill donation was asked the day of the concert with proceeds going to the Cumberland County Veterans Relief Fund helping local veterans in need of assistance and also to Any Soldier Inc.
8 October 09: Marco Island Florida Marriott Resort invited Any Soldier Inc. to attend their "Corporate Partnership Conference" for a presentation and for the attendees to build care packages AGAIN! 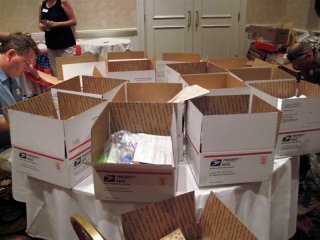 The Marriott sponsors a "Spirit to Serve" event which provides all the contents, packages and postage to allow the attendees of the conference to create care packages, write a note, and send to AnySoldier.com contacts. Marriott International really supports the troops!! 18 August 09: XO Communications, a telecommunications company headquartered in Virginia, selected Any Soldier as the recipient of their service project in conjunction with this year's Peak Performers Incentive Contest. This spring they launched their campaign with a challenge to each of their 32 U.S. markets to create up to two themed care packages for soldiers. In fact, they themed their entire program around this cause - "Winners support those who make winning possible." On Wednesday, August 18th, as the 40 salespeople whose achievements earned them Peak Performers status, gathered for a GPS guided Scavenger Hunt, ten active duty soldiers entered the ballroom to join them and stay for lunch at the Broadmoor, during which the short film, "Tango Tango Mike" was shown. During this luncheon XO announced a $1000 donation to Any Soldier and encouraged everyone to return to the ballroom to pack up the boxes for shipment to the troops. Over 180 boxes were sent as a result of this effort, including items such as iPods and gift cards, footballs, over 100 DVDs, huge quantities of personal hygiene products, socks, blankets, pillows, toys, books, games, magazines, even lottery tickets and a golf club! 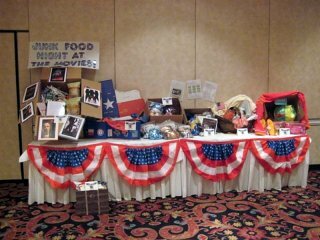 Of course there was also every kind of non-perishable food known to man, some of which went into every box they packed. And the letters…so many letters of thanks, good wishes, and heartfelt compassion. But the highlight of the day was when each of the ten soldiers, on their own, stood up and spoke to the group to tell them what their care packages and letters will mean to the troops in harms way. There was not a dry eye in the room as they recounted the importance of knowing their efforts and sacrifices are appreciated by those at home. Several of them were shipping out within the next couple of months so the XO participants exchanged email addresses with them so they can continue their support. XO Communications, as a company and as many individuals, demonstrated what Any Soldier is all about and they did it in a very big way. It's hard to say who benefited more from their efforts, but it is certain that this experience will always be remembered. 6 April 09: After months of planning by Major Bourland for a golf tournament at Quantico, last minute changes in base policy by the Marines wouldn't allow it. So, taking lemons and making lemonaid being the stuff of Support Junkies, Anna Renault and others put together a dinner nearby at The Globe & Laurel Restaurant. Even Peggy Kane flew in from California! Amazing what Support Junkies can do! 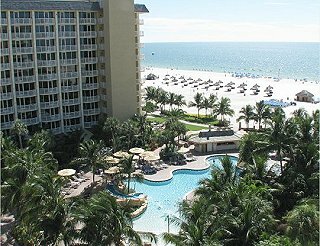 31 March 09: Marco Island Florida Marriott Resort invited Any Soldier Inc. to attend their "Mission Business Sessions" for a presentation and for the attendees to build care packages. Marriott never ceases to amaze in it's beautiful resorts, and continuing support of our troops. 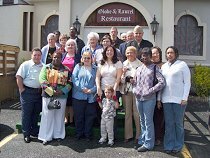 21 March 09: Bob Havens of Fort Wayne, Indiana, organized a "Packing Party" as part of his Eagle Project. Scouts who are about to earn the rank of Eagle have to do a service project, and Bob chose AnySoldier.com for his. Over 100 Boy Scouts have used this web site for their Eagle Project and we were hononed to be invited to attend this one. 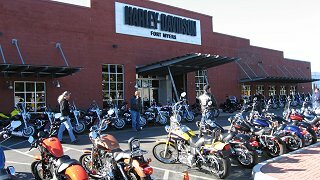 Harley-Davidson of Fort Myers, FL teams with AnySoldier.com! 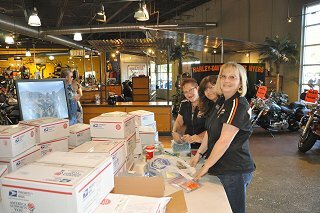 31 Jan 09: Hundreds of people showed up at Harley - Davidson of Fort Myers on Saturday to send a personal gift overseas to our troops. They are collecting care packages to send to Iraq and Afghanistan. Each box will have different items in them, but all will be sending the same message. People back home are thinking about you. 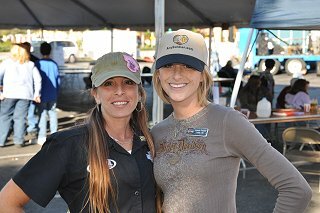 Harley-Davidson of Fort Myers and AnySsoldier.com teamed up to host the ultimate party for america's troops overseas. 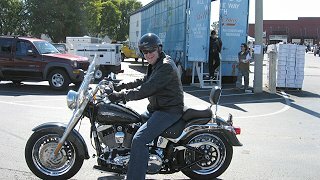 The party kicked off Saturday morning with bikers taking part in a poker run, live music, and of course treats. 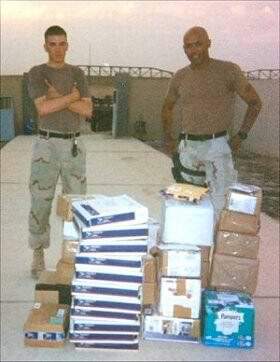 21 Jan 09: Xerox sends 51 Care Packages! 9 Jan 09: TORRANCE, California - Towers Elementary (in conjunction with Alta Vista in Redondo Bch) is doing a service learning project by sending letters, and hand drawn pictures to U.S. Troops in the Middle East. The purpose of the project is to encourage students to participate in the global world and learn how simple acts of kindness and care can positively affect someone's life. It gives them the opportunity to learn about patriotism and appreciate the brave men and women who are in foreign lands without their own families. Jeri Reeder reports. 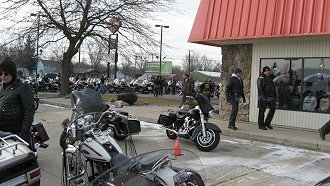 13th Annual "Polar Bikers Ride"
1 Jan 09: Sponsored by River City Harley-Davidson of Fort Wayne, Indiana, the ride was attended by over 100 bikes, to include representing Any Soldier®, Marty on the Ultra. Good to know that he wasn't the only crazy out there in the mid-20s temperature. 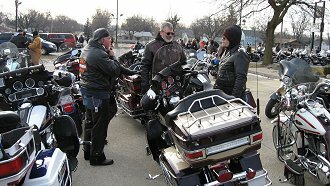 The ride was to benefit Cancer Services.